Multi-sports mode: walking, running, cycling, swimming, etc. The KingWear KR04 multifunctional fitness tracker will help you control your physical activity and distribute your workouts rationally. 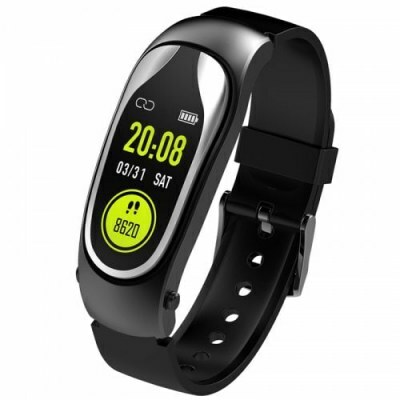 With the help of the bracelet you will be able to determine the number of steps during morning jogging, distances covered during the day, the state of cardiac activity at different levels of loads, and also – to control the quality of sleep by setting the necessary parameters about its phases. You can connect to your smartphone via wireless Bluetooth communication based on Android and iOS operating systems. Wired connection to a computer or laptop is supported via USB-port. Not only will you be able to see information about your physical activity on your smartphone, but you will also be able to receive notifications from the latter to the tracker. When the phone sounds off, the vibration signal about SMS messages, calls, comments from social networks will allow you not to miss important notifications. The KingWear KR04 case reliably protects its components from dust and moisture. Thus the bracelet is not afraid not only sweat, but also rain.